Birmingham, Ala.; Montgomery, Ala. – A four-page layout about civil rights landmarks in the February issue of Southern Living features photographs provided by the Alabama Tourism Department. The spread opens with a large photo of Selma’s Edmund Pettus Bridge, followed by images of Birmingham’s 16th Street Baptist Church, Little Rock’s Central High School, the Woolworth’s “sit in” lunch counter in Greensboro, N.C., and the Lincoln Memorial in Washington, D.C. The article includes thoughts from U.S. Rep. John Lewis, a native of Troy, who was asked to comment on these important civil rights sites. Editor Evans draws attention to the feature in his column near the front of the magazine. Meripol’s photos were the centerpiece of a 2015 publication promoting civil rights landmarks as potential World Heritage Sites. The book What Happened Here Changed the World received the American Advertising Federation’s national silver award for book design. 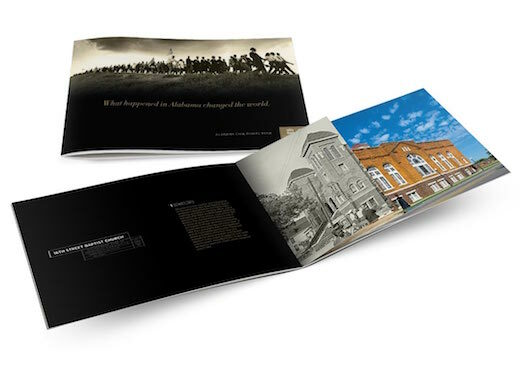 The Birmingham ad agency Luckie & Company designed the book around Sentell’s concept of vintage and current photos of landmarks. Southern Living is sold in Books-A-Million stores, grocery stores, and other locations where magazines and books are sold. Meripol was the photographer for the tourism department’s book Alabama Barbecue, which was distributed during The Year of Alabama Barbecue in 2015. This entry was posted in Agency News, Press Releases and tagged Addy, alabama civil rights, alabama tourism, black history month, civil rights landmarks, southern living magazine, world heritage sites. Bookmark the permalink.